EA have added a brief trailer to their official EAVision Youtube page. Under the videos tab is a 19 second long teaser for Crysis 3. Although the trailer is very brief, it manages to get quite a lot across fairly quick. It starts by showing you the city of New York having been sealed in the enormous nanodome, the city really does appear to be in a drastic state after the events of Crysis 2, it’s dark and dingy, as if there would be no life there at all. 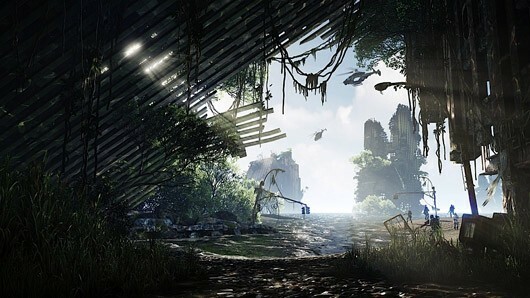 The trailer then moves on to a clip of a solider in a nanosuit running through the city while under heavy fire, however the eagle eyed viewers will probably spot that the city appears to be draped in luscious trees and foliage more fitting to tropical environment, and actually rather similar to plant life found in the original Crysis. The video then closes with a few brief clips highlighting the new bow and arrow weapon, which starts with what appears to be a brief clip of gameplay, with the player holding the bow and arrow weapon whilst hiding inside a building which is being shaken to pieces by the force of a passing alien ship. This follows with a brief clip showing the weapon folding out from a closed position, and then a view of the arrow being fired, which may possibly be an indication of a view we could expect to see in game when using the weapon. This then closes off by showing the logo for Crysis 3, followed by the web address for the official Crysis website, and a brief statement saying “Gameplay Trailer April 24th”. Although brief, I found it to be a lot more exciting than the trailers for Crysis 2 even when being advertised on TV. The state the city is in looks like it would make for a much more exciting environment for a FPS with stealth elements, and should hopefully be capable of delivering on those features a bit more because of the design change. Be sure to check back on Tuesday for the gameplay trailer!